I wrote few days ago about Wolfram Search(so-called 'Google-Killer') on this very blog, and today, Google has taken some of it's tools out. 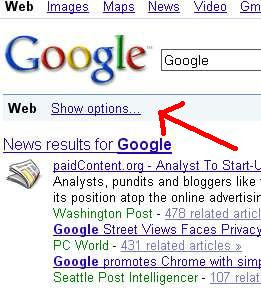 Google is going to dominate Search Engine world with it's new killer features. The new features include blazing fast, accurate and time relevant search results. If you've cared, they've stuck a new option called 'Show Option' on their search result page. Just click there, you'll see the another realm of search. 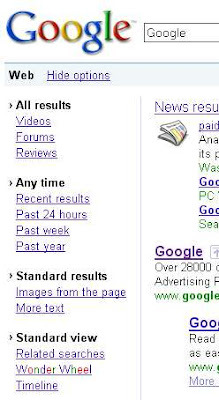 I used to go to 'advanced search' to look for time based content. But with this new feature on, it's pretty quick. Just click one of those time related link like anything posted in past 24 hours/week/year etc. If you want to check reviews, just click 'reviews', if it's for videos, just click 'videos', no more fiddling with keywords and phrases. Google has made our lives easier with these new features. There are lot more features on it, which I urge you to check out for yourself. You may get more idea on this from Google's blogpost, click here to read.